Laser rangefinders have advanced rapidly in recent years and this offering from Bosch, the GLM 80 Professional, is no exception. The combination comes with the R60 Professional measuring rail, which itself is a nice aluminium extrusion with horizontal and vertical level vials/bubbles, both on this example being accurate. 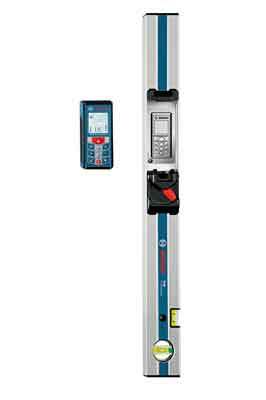 The premium price for this 600mm level is due to the socket into which the GLM 80 locks to provide a digital level measuring to 0.1° accuracy. 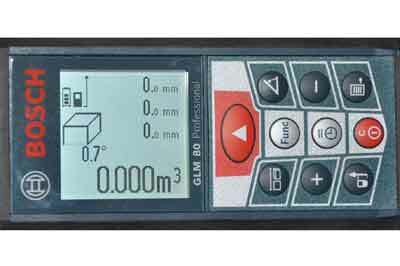 Using the GLM 80 to measure is simple. Four different reference positions are available: front edge, rear edge - default setting - a pointer that deploys from the rear edge to allow corner measuring, or from the centre of thread of the tripod attachment on the underside of the body. A tripod is available as an extra, as are laser enhancing glasses and target plate - useful in poor conditions and for poor reflective surfaces. 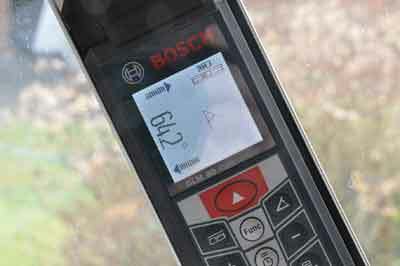 When in simple measuring mode, there is also a small display of inclination; one button press changes this to the primary display and switches on the audible horizontal/vertical beep. In range finding mode it also shows inclination and with one button press this function takes over with a clearer, dedicated display. When measuring, up to 20 results are stored and this may be the first suggestion that it is too clever for its own good. I know that if I take even three measurements I need to have some means of recording what each refers to; the GLM 80 just displays a list. What is useful is being able to add each measurement as you go so finding the total length of multiple skirting, for example. 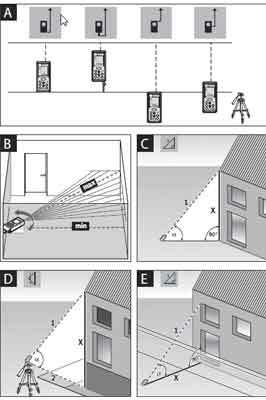 The rangefinder can be set to measure continuously so using it as a substitute for conventional tape is possible and it records the minimum and maximum measurements while in this mode - in other words, find the shortest and longest distances from the measuring point. I tested this function successfully on an old door casing, which I knew was not well installed. 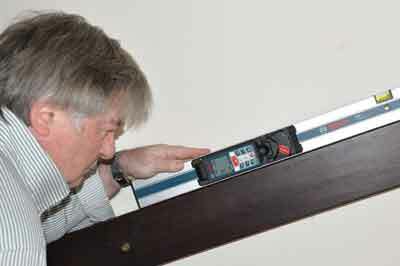 Indirect length measurement allows the unit to be placed on a horizontal surface and then tilted up so the laser hits the target height you wish to measure - for example, the height of a vertical wall but where access to the bottom of the wall is not possible. By measuring the inclined angle and the inclined distance it then calculates and displays the vertical height of the target above the horizontal plane. Think that's clever? It will do the reverse and use the inclined measurement to calculate the horizontal distance. It also does double indirect measurement not requiring a horizontal plane. 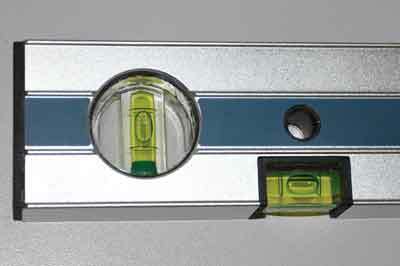 Using with the R60 allows more accurate level measuring. 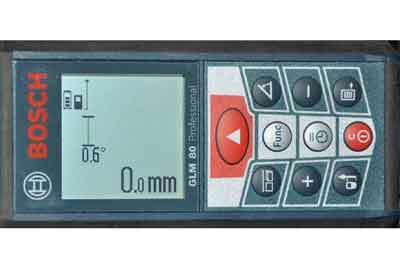 The GLM 80 clips securely into a socket and pressing the 'measure' button converts it to a digital level. Alone and combined with the rail the GLM 80 can have the level function recalibrated but unfortunately the methodology for the two are slightly different and I found the instruction diagrams slightly confusing and the process just a little frustrating. However, once recalibrated, the unit measures accurately. 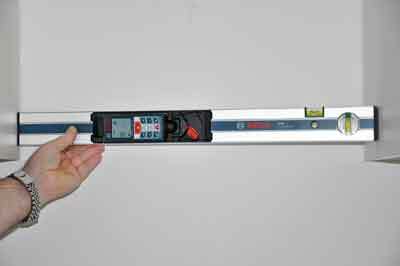 In use the GLM 80 is accurate and basic measuring is easy. Unless in regular use the other functions can become a dim memory requiring reference to the manual again. A pocket guide is included but as this is purely pictorial it too can seem a bit of a mystery. The display is clear with a two level back-light but I could find no way to maintain the screen light on at full brightness and I have yet to work out what the auto brightness setting does. Whoever designed the user interface - the UI - or what each button does and how, needs to go on a good ergonomics design course as logic seems slightly lacking. This combination is accurate and highly functional albeit in a 'could-do-better' ergonomics way. It is expensive and I would suggest most users save some money and buy a cheaper and simpler rangefinder and a dedicated digital level. Both requirements can be satisfied by other excellent pieces of kit in the Bosch range.